This growth in diversity among the nation’s midterm electorate reflects population growth and increased participation among minority groups, but also reflects a decline in participation among whites. There were some 2.9 million fewer white voters in 2010 than in 2006. In contrast, there were 1.1 million more black voters in 2010 than in 2006, along with one million more Latino voters and 200,000 more Asian voters. When it comes to participation rates, a greater share of whites participated in the 2010 election than any other group, despite a decline in the number of white voters. Nearly half (48.6%) of all white eligible voters say they cast a vote in last year’s election, while 44% of blacks, 31.2% of Hispanics and 31% of Asians voted. Participation rates in midterm elections among all three of the nation’s biggest minority groups have lagged those among whites. For blacks, this gap has narrowed—to 4.6 percentage points in 2010, down from a peak of 12 percentage points in 1994.4 However, the gap in participation rates between whites and Latinos (17.4 percentage points) and between whites and Asians (17.6 percentage points) has largely persisted in recent elections. And while the gap between whites and these two groups was smaller in 2010 than in 2006, much of that decline was due to falling participation rates among whites. Even so, participation rates among Latinos and Asians have also declined as the number of eligible voters has grown faster than the number of voters in each group. 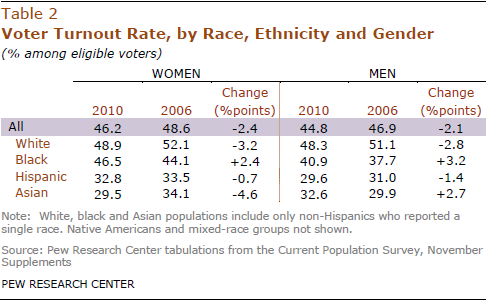 Voter participation rates were higher among female eligible voters than among male eligible voters in 2010. Among women, 46.2% voted while among men, 44.8% voted. When examined by race and ethnicity, women had higher rates of participation than men in 2010 among black and Hispanic eligible voters, but not among Asians. This continues a pattern seen in recent elections of higher rates of electoral participation among women than among men. In the 2008 presidential election, 65.7% of women voted, while 61.5% of men did so (Lopez and Taylor, 2009). Among young people ages 18 to 29, voter participation rates were highest among blacks. Some 27.5% of black, 24.9% of white, 17.7% of Asian, and 17.6% of Hispanic young people voted (Center for Information & Research on Civic Learning and Engagement, 2011). In recent election cycles, states have made it easier for citizens to cast a vote. From early voting to Election Day registration, potential voters do not necessarily have to show up at their polling place on Election Day to cast a vote. According to Pew Hispanic Center tabulations, one-in-four (24.9%) voters in 2010 took advantage of these opportunities, up from one-in-five (18.5%) who did so in 2006. 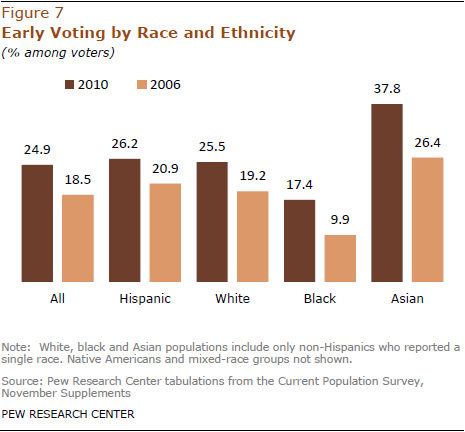 Among all major racial and ethnic voter groups, early voting rates were up. The November Supplement to the Current Population Survey asks those who were registered to vote but did not vote why they did not vote. Among all registered voters who did not vote, the single most common reason given was “too busy, conflicting work or school schedule.” More than one-in-four (25.5%) of all registered voters who did not vote said this. The second most common reason given was “not interested, felt my vote wouldn’t make a difference.” Some 15.6% of registered voters who did not vote cited this as a reason. 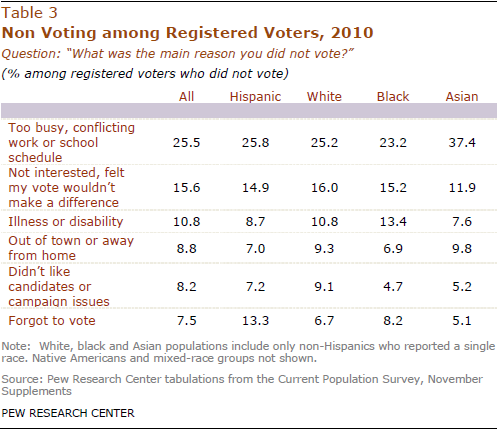 When examined by race and ethnicity, for all major groups, the number one reason given for not voting was “too busy, conflicting work or school schedule.” This was highest among Asian registered voters who did not vote—some 37.4% cited this reason. One other reason offered was “forgot to vote.” Overall, 7.5% of all registered voters who did not vote cited this as the reason they did not vote. But among Latinos, nearly twice as many cited this reason—13.3%—making this the third most common answer given among them.